Audio: “Lawton Park – Civil War Memorial” featuring Tom Castaldi. Courtesy of 89.1 WBOI. In what is now Lawton Park stands a monument dedicated to Civil War veterans that resided from Allen County. The monument which was built by Bureau Brothers out of Philadelphia Pennsylvania and Keller and Braun, who were from Fort Wayne, was dedicated October 10, 1894. Its principal donors were Louis and Charles Centlive. As a result of the secession from the Union by many southern states in December of 1860, a bi partisan meeting of prominent Fort Wayne men was called, to voice their beliefs of where Indiana stands on the issue. The conclusive outcome of the meeting was, “Indiana for the union, first, last, and always.” Once news broke of shots being fired at Fort Sumter, partisan parties were no longer an issue, Fort Wayne and Indiana had one goal: unity to the Union flag. On the eve of the war, in 1860, Allen County had a population of 10,388. By the time the war ended in 1865, Allen County had sent 4,103 soldiers to fight for the Union; 489 of those soldiers ultimately lost their life. 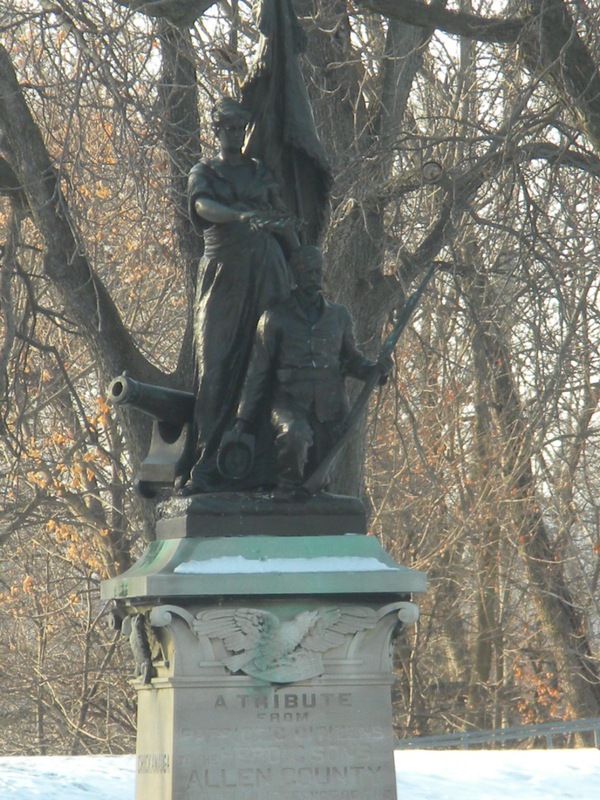 The Civil War monument, which is located in present day Lawton Park. “On the Heritage Trail: Fort Wayne Indiana A Walking Guide Book”, written by: The Bicentennial Heritage Trail Committee, (1994). “City Sent Thousands to Civil War Front Lines”, Hubbart, Kerry. The News Sentinel. April 26, 2011.